Before the conceptualization of residual income, people would create blogs only to express their thoughts, ideas, opinions, and everything else under the sun and to share those with friends, colleagues, and random readers from around the world who log on to the internet. The first step to setting up Google Adsense on your blog is to create the blog first. There are many possible blog services to choose from like WordPress or Blogger, the latter being the easiest blog to set up ads on. After creating and arranging the lay-out of your blog, you should post a couple of entries because the Google Adsense team would first review your site to determine what related ads to place on your blog. The second step is to apply for a Google Adsense account. You won’t be able to earn without it, so make sure to open one by creating a Google account and signing into Adsense using your account details. After this, Google will then send you an e-mail asking you to verify your e-mail address. Make sure to click on the link so that your application will be sent and a representative will visit your site or blog for review. Since we’re talking about Google Adsense on a blog, continue posting regularly because they’ll be sending you a notice about their overview in a matter of days. If the Google Adsense team sends you an e-mail of approval, you can then log into your account to get the HTML code, which is what you will paste into your blog or website. You can find this in the Adsense Setup tab, which is where you will find context-sensitive ads under the Adsense for Content link. The next step is pasting the code into your blog’s HTML editor. Always make sure that you are inserting the code as HTML and that you are pasting it into your blog’s template so that you won’t have to keep putting it in every post you make manually. By following these steps and posting great content for traffic, you’ll be surprised one day to find money in your account and a letter from Google with your PIN code for you to use to access your funds. 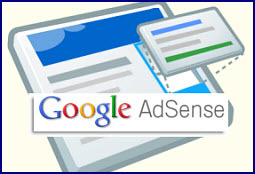 For more step by step information, visit Google Adsense.